SEO (Search Engine Optimization) isn’t easy, we already know this. All Google wants is to provide the searcher with the best result for his particular search. If you help Google with this, they will absolutely reward you with higher search results. But this is like getting a job when you don’t have any experience. It can be very frustrating. Of course, you need to have really amazing, well written and optimized content on your page. That is just a start. But let’s say you REALLY DID write a page that is the perfect answer to the person searching for a particular search. That may get you in the top 100 but then what? How do you compete with those results already in top positions and move further up in the rankings? Well one of the main metrics or indicators Google will look at is the Bounce Rate on your page. They will look at it in general, and then specifically they will compare the bounce rate of your page vs. the other pages that show up for the same search query. 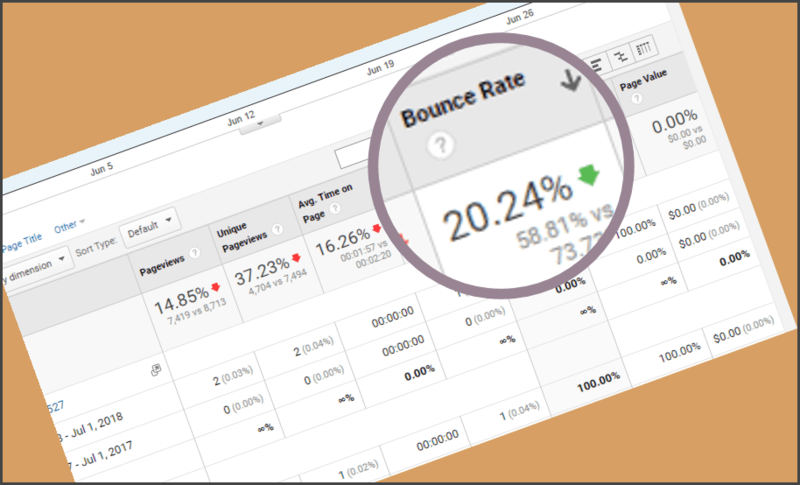 So let’s step back and first understand what a bounce rate is. If you do a search and click on a result, then go to the page and don’t find what you want, you will most likely leave that page and do another search, or even hit the back button and perform the search again to find another result for the same search. So in essence you are “bouncing” from the page. Your bounce rate is the number of users who land on your site and quickly leave, over the total number of users to your site. So if 50 users out 100 bounce, your bounce rate is 50%. If you had found what you wanted in the original search, you would have dwelled on the page you clicked to for a while. No one knows for sure how long you need to stay on a page for it to be considered a good result, but we know Google will compare this dwell metric to other pages in your search query. The other thing you might do if you got the result you wanted is to look at other pages on the same website. In either case, this is not bouncing and is a huge indicator to Google that you found what you want. If this is the search behavior on your site, you would be rewarded with higher rankings for that search query. You can find your bounce rate for your site as a whole, and even for particular pages. From there you can monitor your bounce rate, compare it to a previous period, and all the other amazing things Google allows you to do with your analytics. Simply go into your Google Analytics and look at the Behavior Report -> All Pages and you will see something like this. We compared bounce rates on this client’s home page for the same period the year before and you can see that the bounce rate improved going from 60.78% to 47.04%. This is a very good thing and we expect Google to reward this client over time with better search positions. What, you may ask, can you do to get people to stay on your page and not bounce, and then to stay on your page or site longer? The most important thing you can do is give them incentive to stay. Do this by writing better, more interesting content, not just keyword stuffing. Add a simple but engaging video, we talked about this in this newsletter. Give them links to some of your blog posts so that they stay on your site for even longer. Have a request for quote form on EVERY page! This is something that is tracked by Google as an event so it is the jackpot for you. Take a look at your bounce rate and then work on getting it down. Let us know if you have any questions or need help with this.